18 20 13 3 8 26 14 24 20 14 23 1 16 17 13 3 5. In the nineties, new encryption software that could protect telephone conversations, faxes, and e-mails from unwarranted monitoring was coming on the market, but the programs could also block entirely legal efforts to eavesdrop on criminals or potential terrorists. Under McConnell's direction, the N.S.A. developed a sophisticated device, the Clipper Chip, with a superior ability to encrypt any electronic transmission; it also allowed law-enforcement officials, given the proper authority, to decipher and eavesdrop on the encrypted communications of others. Privacy advocates criticized the device, though, and the Clipper was abandoned by 1996. "They convinced the folks on the Hill that they couldn't trust the government to do what it said it was going to do," Richard Wilhelm, who was in charge of information warfare under McConnell, says. But that's not actually what happened. In fact, almost everything about this quote -- the whos, the whys and the whens -- is not merely slanted in its interpretation, but factually contradicted by the public record. More generally, while Congress (presumably the Hill on which the folks referred to above resided) held several hearings on the subject, it never actually enacted (or even voted on) any cryptography legislation during the 1990's. Instead, the relaxation of cryptography export regulations (the lever through which the government controlled US encryption software and hardware) was entirely a product of the executive branch. Department of Commerce export regulations that took effect at the beginning of 2000 effectively eliminated the major controls on mass-market and open source encryption products, and in 2004 the rules were relaxed even further. In other words, the current policy promoting widely available encryption has been actively supported not just by the previous administration, but by the present one as well. Government attempts in the 1990's to control cryptography were ultimately doomed not by some kind of weak-kneed policy capitulation (even if some in the national security community might now find it convenient to portray it as such), but by inexorable advances in technology (particularly what Larry Lessig calls "west coast code"). Even before the hardware-only Clipper program was announced, the performance of software-based encryption on general purpose computers had become competitive with that of expensive purpose-built encryption chips. At the same time, growth in the largely open-source-based networked computing world increasingly depended on reliable and inexpensive communications security, something fundamentally incompatible with the key escrow scheme underlying Clipper. Coupled with the inherent risk that a central encryption key database would itself become a target for foreign intelligence agents, it became apparent to just about everyone by the end of the decade that decontrol was the only viable policy option. Tellingly, even after the attacks of September 11th, 2001 the Bush administration made no serious attempt to control or otherwise reign in the public availability or use of strong encryption. Indeed, its only action on cryptography policy came in 2004, when it further liberalized the few remaining export controls on the technology. It's unfortunate that the New Yorker failed to check the facts about Clipper, but that's not the central concern here. Intelligence agencies (and their officials) largely operate under a thick veil of legally enforced secrecy, carrying with it a special obligation to be scrupulously truthful in their analysis. Should we trust them to be more forthright than the former official quoted in the excerpt when the facts are not so easily checked? We often have no choice. When I published my Clipper paper in 1994, the NSA -- to its great credit at the time -- immediately acknowledged the problems, despite the embarrassment the whole affair no doubt caused them. And that is precisely how we must expect our intelligence agencies to behave. Intelligence spun to serve a political narrative isn't intelligence, it's just politics. 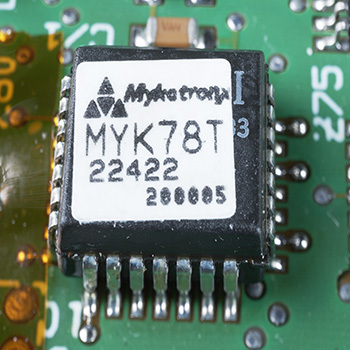 Photo above: Mykotronx MYK-78T Clipper Chip, as installed in an AT&T TSD-3600E encrypting telephone. More Clipper photos here.